been serving the valleys village of Blaengwynfi for 30 years and was celebrating an important anniversary. The shop was set up during the Miners Strike in 1984 and its ethic of providing an essential service to the community is still very much in place now. When it was set up, the intention was to ensure that it was sustainable and offered paying jobs in the community it served. Today they employ eight people. Two things struck me about the celebratory event. First was that the shop is run by an extremely enthusiastic group of people, both staff and board members. 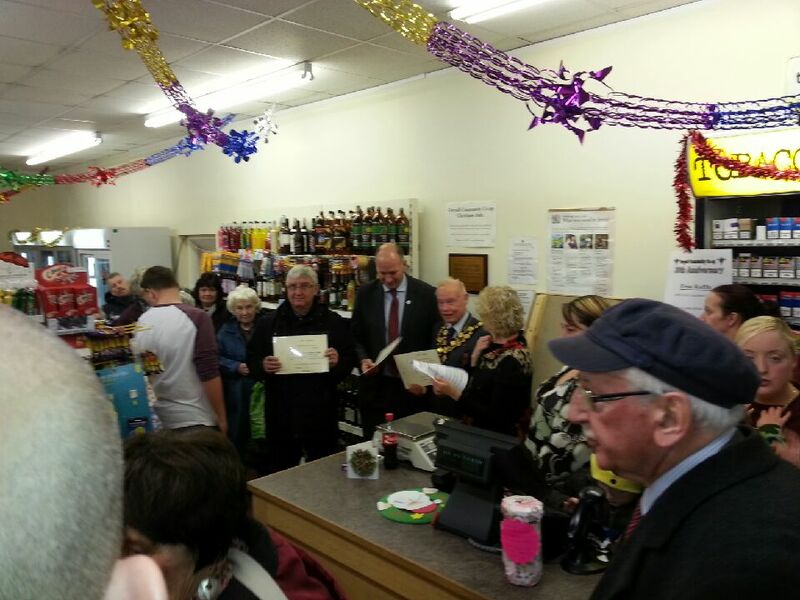 Their commitment to the co-operative went well beyond the shop and deep into the community of Blaengwynfi. They are constantly looking at the services the community needs and how the co-operative infrastructure can serve them. The shop offers a meeting place for teenagers and the co-operative are looking to take on other services in the community and base them from the shop. This year the co-operative is offering a community fund to help groups and individuals in the community. It’s a relatively small amount but it will help people in the community who need it directly. In 2015, they are embarking on a drive to update and recruit new members – I wish them luck with that but I have a feeling they won’t need it! The other thing that struck me was the interest from other communities in investing in setting up community shops and pubs in their own villages. I met a group of people looking to set up a community shop near the Welsh border and, if that worked, to take over a pub in their village at some time in the future too. Another group were looking at starting up a small community shop, while a third group also wanted to take over their village pub. They have realised that the pub is just an element of what is needed for their community hub, and they have started to look at what else could be offered to their community from that base. Things like a small shop, pop up libraries and rooms for health care and beauty services were discussed. Many communities have the ability to run their own community hubs, be they pubs, shops, community centres or even leisure centres. Many of these can provide sustainable employment. All of them can provide services to a community as well as acting as a strong glue that can keep the community together and ensure that it is able to look after the individual needs of its members. Congratulations to Gwynfi Community Co-operative, which is an outstanding example of this. On September 29th in a DWP press release, the Work and Pensions Secretary, Ian Duncan Smith, said; “Universal Credit will be rolled out to all Job Centres and local authorities across the country from early next year”. This marks a significant acceleration in one of the government’s biggest reforms and is a sign of the success of the policy so far. This expansion will be for new claims from single jobseekers. The Wales Co-operative Centre’s Financial Inclusion Project Manger, Jocelle Lovell, asks is this the calm before the storm, and what does this mean for Wales? This signals the start of things to come, for a long time we have been waiting on a clear timeline in respect of the roll out of Universal Credit (UC) and here we have it. Whilst it is only starting with ‘new claims from single jobseekers’, which many will argue are the easiest people to work with. It still signifies a commitment to drive forward the changes, and sends out a clear message to us all that we need to be prepared. This means a joined up approach, mapping and knowing the services available within a local authority area, referral routes to support including face to face, online and over the phone. The local support services frameworks that will underpin UC are currently being tested in 11 sites across the UK, two of which are in Wales, Carmarthenshire and Blaenau Gwent. Alongside this are some great examples where LA’s and service providers have come together in a one stop shop model including Cardiff and Flintshire while others like Caerphilly are maximising the use of library facilities to deliver digital Friday sessions. But we still have some way to go to cope with a full UC roll out. For a long time the Centre has been working to address some of the key concerns raised by the introduction of UC, including financial & digital inclusion through our Financual Inclusion Champions, Communities 2.0 and Tackling Homelessness through Financial Inclusion (THFI) projects and moving people closer to the jobs market through the Social Enterprise Support Project (SESP) and Communities 2.0. Back in 2012, the Centre developed and launched the moneymadeclearwales.org website. Its main purpose is to provide an easy to use site that directs people to expert money and debt advice and other support, without them having to trawl through different websites and endless pages of information. Our experience has shown that people who are less financially and/or digitally capable can be intimidated by the way some websites look & respond, and by the language they use. This, in particular in Wales, is a big concern given our low literacy level (the National Survey of Adult Skills in Wales in 2010 revealed 12% of working age adults have below entry level literacy skills). We have further developed the site to include a work and money section, that is aimed at those people who are less financially or digitally able and are moving closer to world of work. Co-operatives Fortnight runs from 21st June – 5th July. 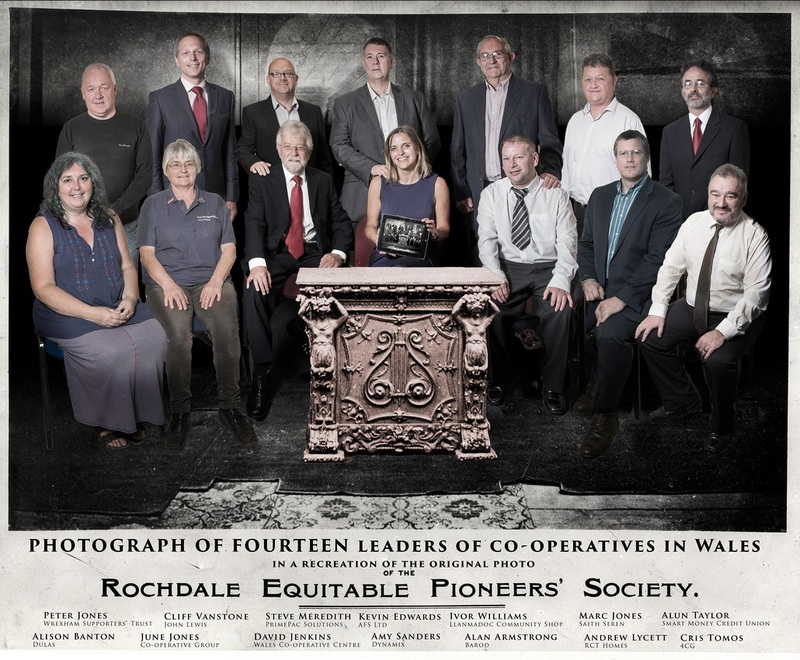 This year, we’re paying tribute to the Rochdale Pioneers who, along with Robert Owen, were among the forefathers of the co-operative movement. We’re doing so by showcasing the work of 14 ‘Modern Pioneers’ from the Welsh co-operative sector, through a series of blog posts. 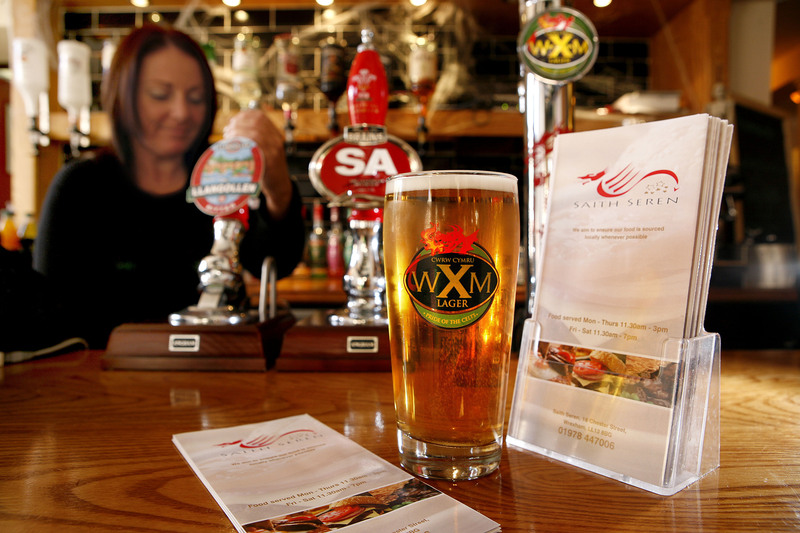 Today’s post looks at the work of Marc Jones, Co-owner of the Saith Seren pub which is a community co-operative. 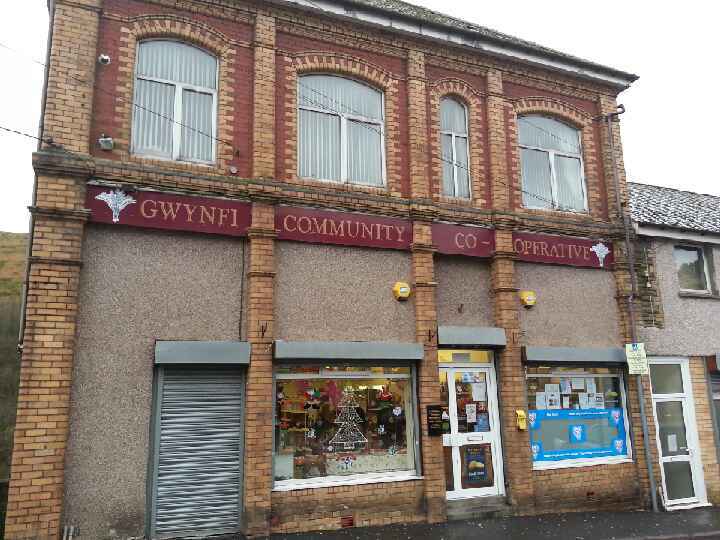 “I chair a community co-operative Welsh Centre in the heart of Wrexham, which has a café bar, regular live music, fundraising events, rooms upstairs for community meetings, a toddlers group and language lessons. We re-opened a historic listed building that had been a pub. 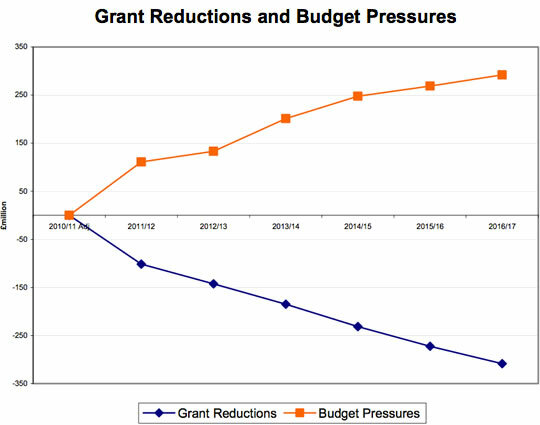 We’ve been open for more than two years now without any grants – just the hard work and funds from our members and volunteers. Big corporations and councils are increasingly pulling out of serving smaller communities in Wales, especially rural areas. Co-operatives and social enterprises are the one way that communities can battle back and take control of their local shops, pubs, services and factories. Co-operatives have to be given far more support to get off the ground, both practical and financial, but the will to develop them is there. It’s a great way to involve a lot of people in a community project but it can also be deeply frustrating because some of the banks and other institutions, including some local authorities, often don’t understand the nature of the enterprise. We have had to make money from day one and our 150 members have sustained us during some lean times. I’m incredibly proud that we have kept going during an incredibly difficult period of trading, both generally and specifically in Wrexham town centre. One of our regulars turned up covered in paint splatters one day and we asked what he’d been up to. His response was that he’d just finished painting the pub toilet walls! We’d been talking about giving them a lick of paint but he went ahead and did it off his own bat. We’re very lucky that our customers will often help out with small jobs and use their trade skills to do the job for mates’ rates. “We are a bridge for Welsh learners, supporters of the language and others whose Welsh may be rusty, to regain confidence and use the language in a social setting. This is particularly the case in a town just 10 miles from the border. We are also a community hub for many voluntary groups and community meetings. Find out more about the Rochdale Pioneers through a special, interactive photo. Mae heddiw yn nodi man cychwyn ymgyrch a gynhelir gan Ganolfan Cydweithredol Cymru ar gyfer Pythefnos Gydweithredol (21 Mehefin – 5 Gorffennaf) sy’n dangos cryfder ac amrywiaeth busnesau cydweithredol yng Nghymru. Trwy gyfres o bostiadau blog, mae’r ymgyrch ‘Arloeswyr Modern’ yn amlygu maint a mathau’r mentrau cydweithredol yng Nghymru a’r sectorau lle y gweithredant. Mae wedi’i hysbrydoli gan Arloeswyr Rochdale, grŵp sydd ymhlith cyndeidiau’r mudiad cydweithredol. Rydym wedi gweithio gyda 14 o bobl sydd wrth wraidd eu busnesau eu hunain, er mwyn egluro sut deimlad yw bod yn rhan o’r mudiad cydweithredol, pam aethant ati i ymuno yn y lle cyntaf a sut y gwelan nhw rôl mentrau cydweithredol yn economi Cymru. Rydym hefyd wedi rhoi cynnig ar ail-greu’r ddelwedd enwog wreiddiol o Arloeswyr Rochdale trwy gyfres o sesiynau tynnu lluniau ledled Cymru, gan ychwanegu’r cyffyrddiadau olaf, hudolus trwy Photoshop. 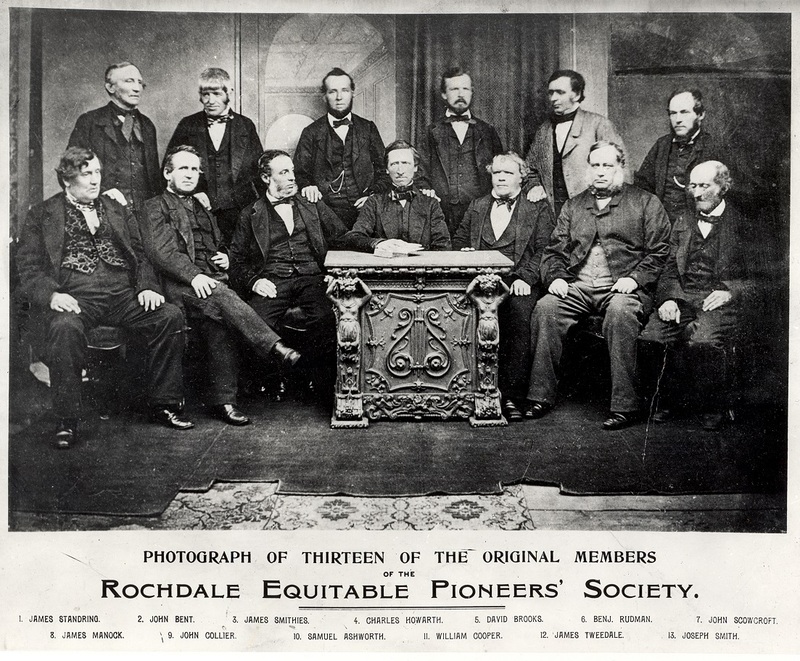 Ffurfiwyd y Rochdale Society of Equitable Pioneers yn 1844 gan grŵp o 28 o bobl, a thua hanner ohonynt yn wehyddion. Wrth i fecaneiddio’r Chwyldro Diwydiannol orfodi rhagor o weithwyr medrus i dlodi, penderfynodd y crefftwyr hyn ddod at ei gilydd er mwyn agor eu siop eu hunain, yn gwerthu bwyd na allent fforddio prynu fel arall. Gan gofio’r gwersi a ddysgwyd o gynigion aflwyddiannus y gorffennol i gydweithredu, cynllunion nhw Egwyddorion Rochdale, sy’n enwog erbyn heddiw, a thros gyfnod o bedwar mis cawsant drafferth cydrannu £1 yr un am gyfanswm o wyth punt ar hugain o gyfalaf. Ar 21 Rhagfyr 1844, agorwyd y siop ganddynt gyda dewis cul iawn o fenyn, siwgr, blawd, blawd ceirch ac ychydig ganhwyllau. O fewn tri mis, ehangwyd y dewis i gynnwys te a thybaco, a chyn hir roeddent yn adnabyddus am ddarparu nwyddau pur o ansawdd uchel. Ddeng mlynedd yn ddiweddarach, roedd y mudiad cydweithredol wedi tyfu i bron 1,000 o fentrau cydweithredol. Mae’r gweddill yn hen hanes. Crybwyllir Arloeswyr Rochdale yn aml yn yr un gwynt â Robert Owen, fel cyndeidiau’r mudiad cydweithredol. Gobeithiwn y gall ein hymgyrch Arloeswyr Modern helpu i godi ymwybyddiaeth o wreiddiau’r datblygiad cydweithredol, gan ddangos yr hyn y mae mentrau cydweithredol yn eu cyflawni yng Nghymru heddiw. Hoffwn ddiolch i bob un o’n Harloeswyr Modern a gymerodd ran, yn ogystal â’r rheini a gynhaliodd y sesiynau tynnu lluniau, gan gynnwys Saith Seren, Amgueddfa Robert Owen, Dynamix, 4CG a siop John Lewis Caerdydd. Diolch hefyd i Mike Dean o Eye Imagery Photography am weithio gyda ni ar y prosiect hwn. Nid yw’n ymddangos mor bell yn ôl â hynny ers y seremoni fawreddog yn Stadiwm SWALEC yng Nghaerdydd i gydnabod llwyddiannau ffigurau blaenllaw’r sector mentrau cymdeithasol yng Nghymru. Fis Hydref llynedd daethom at ein gilydd ar gyfer seremoni Gwobrau Mentrau Cymdeithasol Cymru 2013 ac erbyn hyn mae’n bryd lansio gwobrau 2014! Mae’r enwebiadau bellach ar agor ar gyfer Gwobrau Mentrau Cymdeithasol Cymru… gydag un ychwanegiad newydd cyffrous. Yn ogystal â ‘Menter Gymdeithasol y Flwyddyn’, ‘Seren y Dyfodol’, ‘Prynu’n Gymdeithasol’ (a elwid gynt yn Wobr Menter Datblygu’r Farchnad’) a’r Pencampwr Mentrau Cymdeithasol, mae’n bleser gennym gadarnhau’r categori ‘Ysbrydoli Menter Ieuenctid’ ar gyfer 2014. Bydd y categori newydd hwn yn agored i rai rhwng 8 a 24 oed. Rydym yn aml yn clywed sôn am y genhedlaeth nesaf o entrepreneuriaid ym meysydd eraill busnes. Bydd y categori newydd hwn yn helpu i amlygu talent ifanc sy’n bodoli yn y sector mentrau cymdeithasol yng Nghymru. Bydd llawer ohonynt wedi cael eu hysbrydoli gan y nifer cynyddol o fusnesau cymdeithasol ac rydym yn debygol o weld rhagor o entrepreneuriaid cymdeithasol ifanc yn dod i’r amlwg yn ystod y blynyddoedd nesaf. Lluniwyd y categori ‘Ysbrydoli Menter Ieuenctid’ i annog rhagor o blant a phobl ifanc yng Nghymru i feddwl am opsiynau cymdeithasol a moesegol, wrth ystyried opsiynau busnes y dyfodol neu lwybrau gyrfa. Cawsom ymateb ffantastig i’r gwobrau llynedd. Nid yn unig yr oedd nifer y ceisiadau wedi cynyddu, ond roedd yr ansawdd hefyd wedi parhau i gynyddu. Roedd PS Services, sef menter gymdeithasol yr elusen iechyd meddwl Gofal, wedi mynd i ymlaen i gael llwyddiant yn y DU hefyd trwy ennill y categori Seren y Dyfodol yng Ngwobrau Mentrau Cymdeithasol y DU yn ogystal â gwobrau Cymru. Enillodd PS Services y wobr am ei busnes glanhau a chynnal a chadw tir, a sefydlwyd er mwyn darparu cyflogaeth gefnogol i unigolion sy’n agored i niwed sy’n awyddus i ddychwelyd i’r farchnad lafur. Rydym yn edrych ymlaen at dderbyn eich ceisiadau ar gyfer y gwobrau eleni. Gallwch enwebu eich hun neu enwebu rhywun arall. Rhaid cyflwyno’r enwebiadau erbyn dydd Gwener 11 Gorffennaf. Pob lwc!